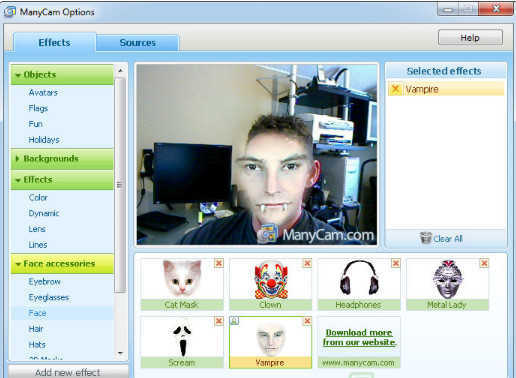 ManyCam is a virtual webcam driver that enables you to use your your webcam with multiple programs simultaneously. You can also add special effects to your video stream, or replace your webcam video with a still image, content from a movie file or stream your desktop in real-time. artificial background images and other effects to your webcam video. You can also add a text overlay or the current date and time. Other features include support for custom effects, color adjustments, picture slideshows and more. ManyCam works with most popular video messengers including Live Messenger, Yahoo and many others.